This week on Flashback, we bring you the journey of an actor, director and a patriot; Manoj Kumar, born as Harikishan Giri Goswami on 24 July 1937, in Abbottabad, Pakistan, then part of pre-partition India. As a youngster, he admired Dilip Kumar and decided to name himself Manoj Kumar, after Dilip’s character in Shabnam. Manoj Kumar graduated from Hindu College, University of Delhi and this is when he decided to enter the film industry. Manoj Kumar who is remembered for his films like: Hariyali Aur Raasta, Woh Kaun Thi?, Himalaya Ki God Mein, Do Badan, Upkar, Patthar Ke Sanam, Neel Kamal, Purab Aur Paschim, Roti Kapda Aur Makaan, and Kranti. Also known for acting in and directing films with patriotic themes, was given the nickname Bharat Kumar. His image as the patriotic hero started with the 1965 film Shaheed, based on the life of Bhagat Singh, the Independence revolutionary. After the Indo-Pakistani War of 1965, Prime Minister Lal Bahadur Shastri asked him to create a film based on the popular slogan Jai Jawan Jai Kisan. The result was Kumar’s magnum opus and directorial debut Upkaar (1967). In it, he played both a soldier and a farmer. The film was also noted for the famous song “Mere Desh Ki Dharti”, composed by Kalyanji-Anandji and sung by Mahendra Kapoor. Upkaar was a hit and won Kumar his first Filmfare Best Director Award. Manoj Kumar returned to patriotic themes in Purab Aur Paschim (1970). In 1972, he starred in Be-Imaan and directed and starred in Shor (1972). The latter, opposite Nanda, was not a huge box office success on its release but gained cult status over the years. It featured the memorable song “Ek Pyar Ka Nagma Hai”, a duet by Lata Mangeshkar and Mukesh, which was composed by Laxmikant-Pyarelal and written by Santosh Anand. In the mid-1970s Kumar starred in three hit films; Roti Kapda Aur Makaan (1974) which was a social commentary, featuring an all-star cast including Zeenat Aman, Shashi Kapoor and Amitabh Bachchan, that won him his second Filmfare Award for Best Director; Sanyasi (1975) had Manoj Kumar and Hema Malini in the lead roles of a religious-themed comedy; and Dus Numbri (1976) which was also a success. In 1981, Manoj Kumar reached the peak of his career when he got the opportunity to direct his idol, Dilip Kumar, as well as star in Kranti, a story about the struggle for Indian independence in the 19th century. Kranti was the last notable successful film in his career. After Kranti, Kumar’s career began to decline in the 1980s as all of his subsequent films failed at the box office. In 1989. He quit acting after his appearance in the 1995 film Maidan-E-Jung. 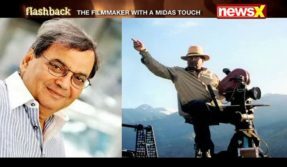 For more Entertainment and stories watch Flashback on NewsX every weekend on Saturday at 10:25 AM and 2:25 PM and for a repeat show on Sunday at 03:25 PM.